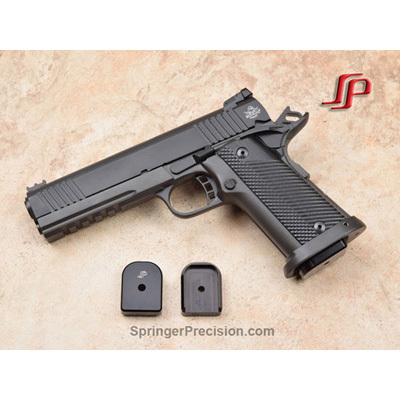 Para Ordnance P18 10 round .38 Super or 9mm magazine with a blued finish. This magazine is also compatible with the Bul M5 IPSC 9mm (won't fit properly if it has the magwell), Rock Island Armory 9mm 1911 A2 and Armscor 9mm 1911 A2 FS PS. I have been told that the will also work in the Bul M5. However the magazine catch has to be altered, widened a bit. The Rock Island Armory .22 TCM originally came with the Mec-Gar P18 magazines but there has been modifications made to the feed lips to increase reliability with the .22 TCM. These magazines don't have the modified feed lips. While some have used these magazines with the .22 TCM with no issues many have feeding problems. The magazines were made for the 9mm and .38 Super and there is no need for modified feed lips when used with either the 9mm or .38 Super. If used with the .22 TCM there may be feeding problems. Don't expect the magazines to be 100% with the .22 TCM.